I recently bought a used RS100 and need to renew some control lines/sheets. 1) When it gets very windy the main sheet needs to be able to reach the back of the boat. The factory length is about 1.5m too short in my view. 2) I also added about an extra 1 metre to the kicker. 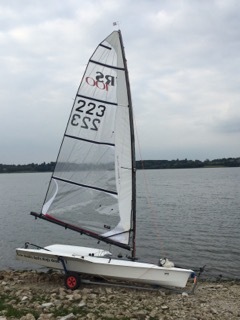 The factory length was fine for normal conditions, but not long enough to fully ease the kicker when it gets very light. The extra length doesn't matter when it's windy. It even makes it easier to grab the kicker when you need to. Many thanks for the quick reply ! Probably a good idea to get a bit longer than 16m and gradually shorten to get the ideal length. If it is too short you will find that the retrieval line flicks the wrong side of the leech and is very difficult to get it to flick off without gybing. 16m sounds too short but i can't recall. In my humble opinion (!) the best kite halyard is English Braids 5mm 'Sprintline' - this is a very low cost rope (£1- per metre) that seems to last for ages and has the major benefit that it has virtually no memory and never twists or tangles (unlike the 8 braid that comes as new !). Personally I don't see any benefit of using a tapered halyard on a boat with relatively slow upwind speed. There is also the issue of the fabric of the chute mouth not being 'fit for purpose' with the supplied 8-strand braid. Whatever you get needs to be fairly soft and gelcoat-friendly otherwise you will quickly saw through into the laminate. Hi, I found Clive Epletts blog really useful when setting up my 100, rope lengths perfect for me and some useful tweaks. Thanks Stuart, it's very useful!